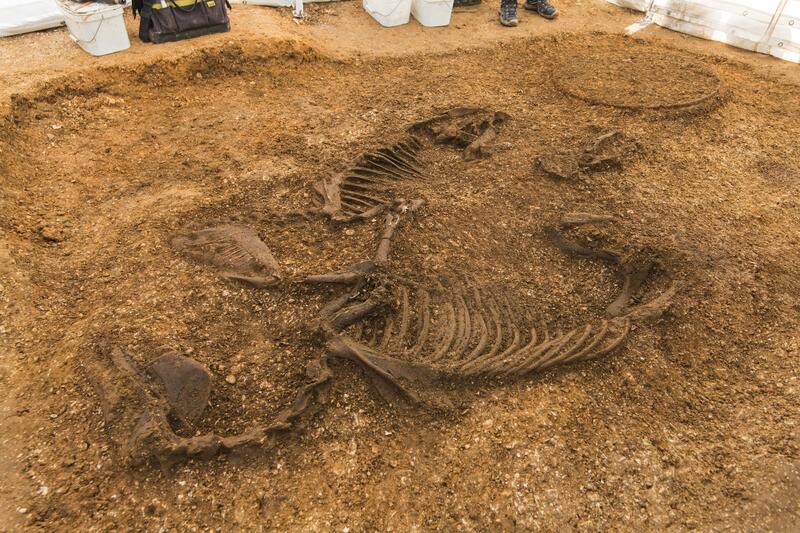 Archaeologists have discovered an extremely rare Iron Age horse and chariot burial in Pocklington, East Yorkshire. The site of a planned housing development on Burnby Lane has been excavated since 2014, and it soon became evident that these homes were going to be built on a major Iron Age burial ground. (I will update this story when the first new resident gets sucked into a television.) So far 75 square barrows and 142 individuals from the middle Iron Age Arras culture have been unearthed there. The Burnby Lane burial graves have yielded remarkable finds before — a man buried on his shield, jewelry, spears, a sword, pots — but the remains of a chariot and two articulated horse skeletons are nothing short of sensational. Only 26 chariot burials have ever been found in the UK (most of them in East Yorkshire) and the last one was discovered two centuries ago. 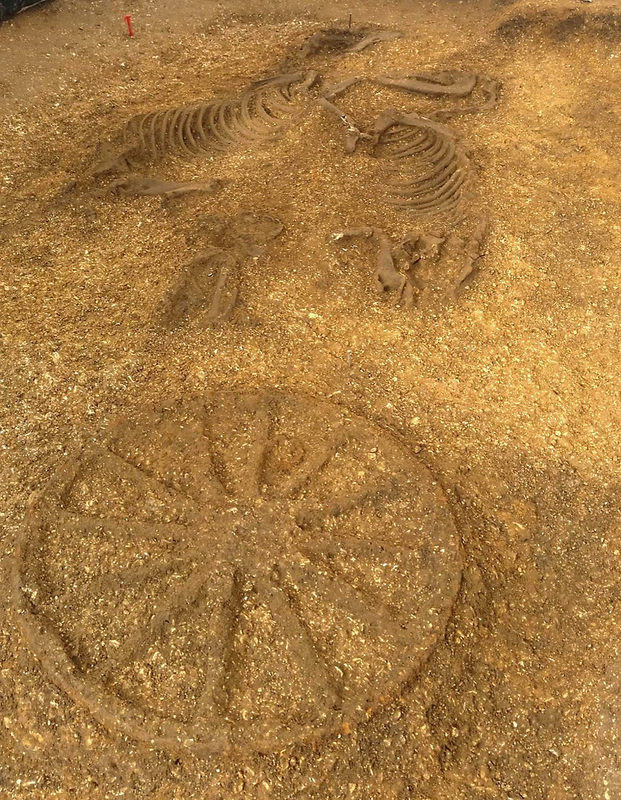 That makes the Pocklington chariot burial the only one of its kind to be excavated with modern archaeological methods, and it’s the only one to include horse burials. 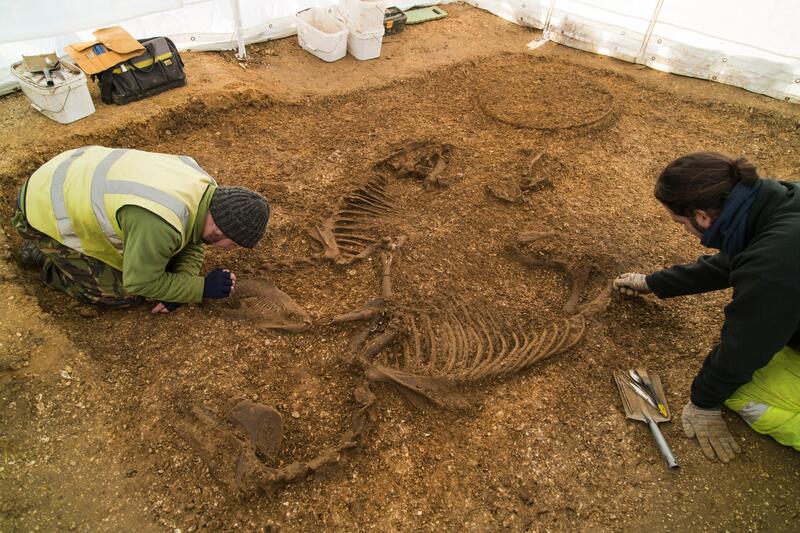 The Pocklington chariot burial, excavated over the past two months, was the final resting place of an upper-class Iron Age Briton – probably a warrior – who lived in the third or fourth century BC. It is possible that he was a member of an ancient British tribe called the Parisi (or their ancestors) – a culture related to other Iron Age peoples in Northern France. Excavating his grave, archaeologists from a Yorkshire-based company MAP Archaeological Practice – [sic] have found the stain ‘imprints’ left in the ground by the rotted wood of the 12 spokes of one of the chariot’s wheels; the iron tyre (which would have gone round that wheel); the stain imprint of the chariot’s central timber pole (which connected the vehicle to the two horses pulling it); the stain imprint of the box-shaped compartment that the driver (and potentially one companion) stood in; the two horses used to pull the vehicle; the bridle bit; the iron nave hoop band (which went round the axle); and the remains of the driver himself. The only missing element (almost certainly destroyed by mediaeval ploughing) is the second wheel. The chariot and horses were found in the last square barrow at the outer edge of the cemetery. It’s a hugely lucky break that it and the other burials in the cemetery survived the millennia. The agricultural work that may be responsible for the loss of the second wheel does not seem to have continued in that field. The neighboring field was extensively ploughed and farmed, but the archaeological gods must have been looking out for the Arras culture’s dead because the land was dedicated to grazing and pasture for hundreds of years, preserving its ancient subterranean burial ground. Researchers will now study any DNA they are able to extract from the remains of the chariot burial and some of the other remains found in the burial ground. They hope to confirm the chariot driver’s gender, health and, thanks to stable isotope analysis, his place of origin. This burial and some of the other highly significant graves will give historians a unique new perspective into the Arras culture. In addition to the warrior buried strapped to his shield, there’s a mysterious man who died from violent trauma inflicted by objects both blunt and sharp and was buried face down much deeper than usual. Archaeologists think he may have been an enemy warrior and was buried in such a manner as to prevent his rising from the grave to take his revenge on his killers. Then there’s the man who was buried honorably with his sword and was then ritually speared. Men, perhaps his fellow warriors, thrust six spears into his body, one into his groin. When his grave was filled and mounded over with earth, the spears were still in his body. Very few other examples of this unusual ritual are known. “This spectacular group of graves is yielding extremely important new information about Iron Age life and culture. 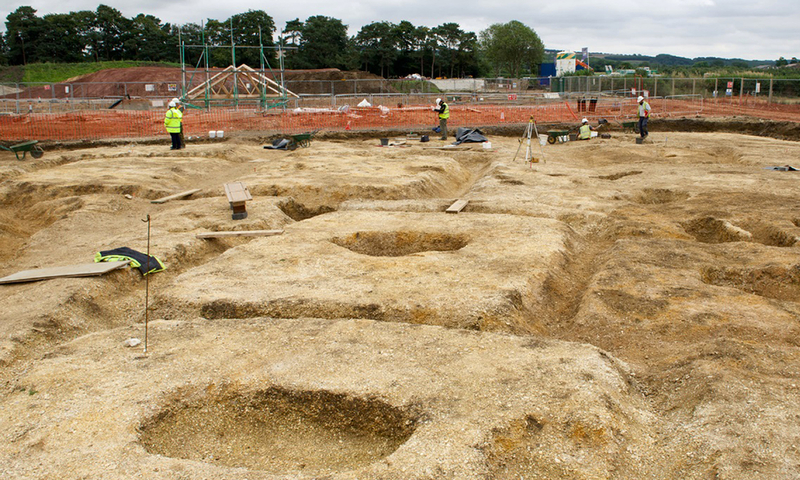 It is one of the most significant Iron Age funerary complexes discovered in Britain over the past half-century,” said one of the archaeologists involved in the project, Dr Peter Halkon of the University of Hull. 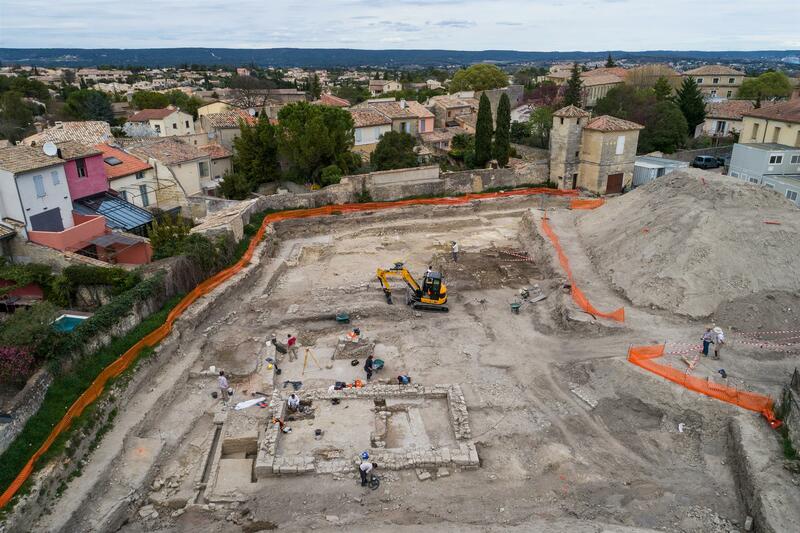 An excavation on the site of a boarding school in Uzès, southern France, has unearthed ancient remains from the 1st century B.C. through the 7th century and beyond into the Middle Ages. 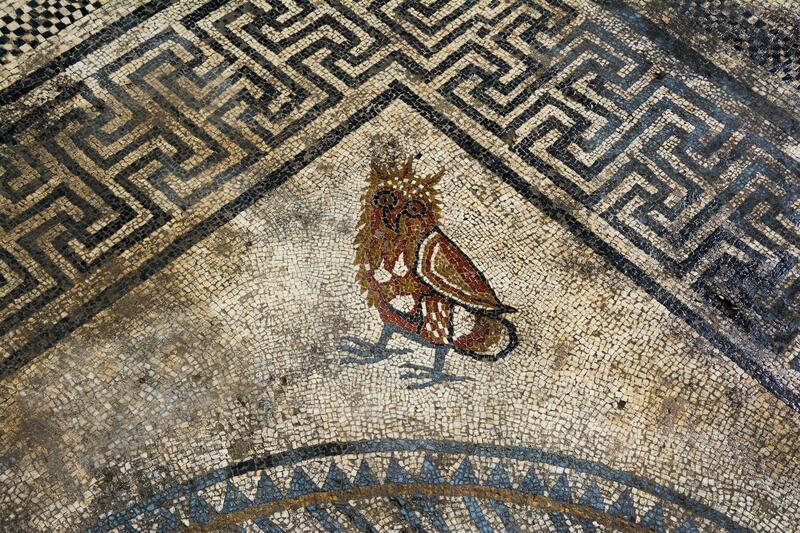 The most dramatic discovery is a pair of large mosaic floors of superlative quality from around the 1st century A.D. 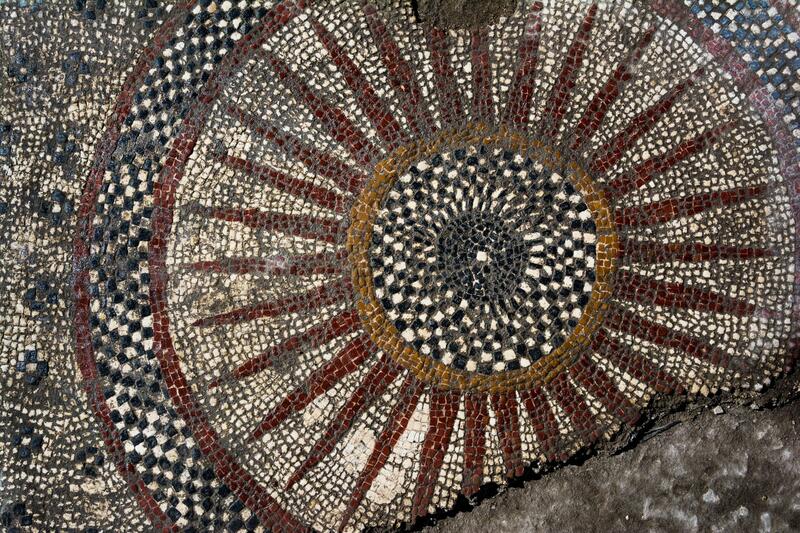 The aesthetic value of the mosaics would make this a find of international significance in any context, but the historical import compounds its value because these are the first significant archaeological remains discovered from the Roman city of Ucetia. 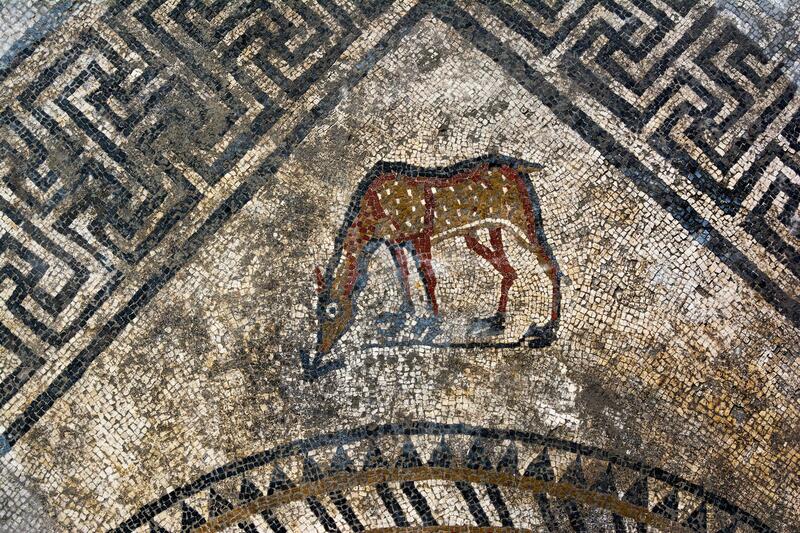 A smattering of mosaic fragments have been unearthed over the years in Uzès, but before now, the existence of the town was documented archaeologically solely by its mention in a geographical inscription in Nîmes. 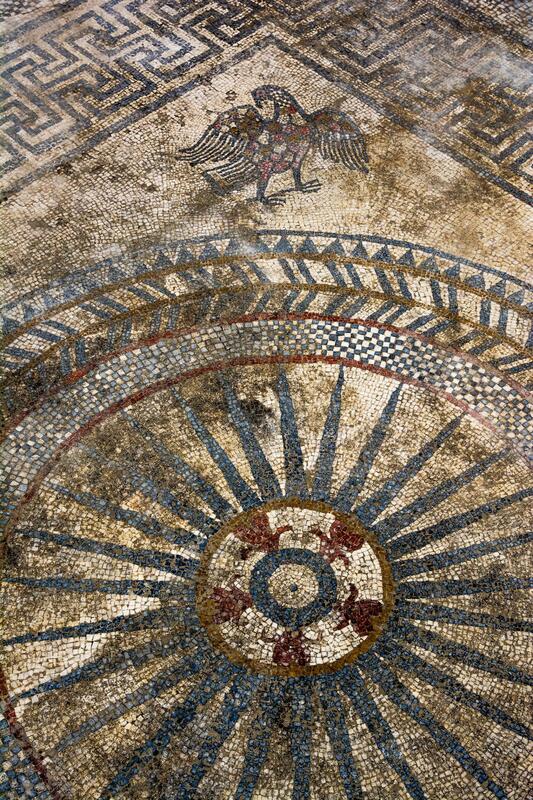 Ucetia was founded in the 1st century B.C. as a Gallo-Roman oppidium (fortified settlement) at the source of the Alzon river, a strategically important location that only increased in significance as the starting point of the Augustan-era aqueduct that carried water 15 miles south to the important Roman colony and regional capital of Nîmes. The magnificent Pont du Gard is part of this aqueduct system. 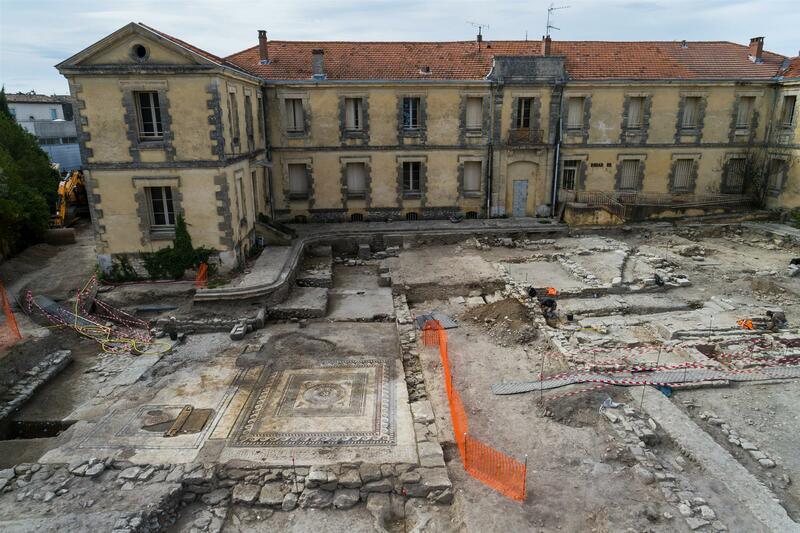 The earliest finds unearthed by the team from France’s National Institute for Preventative Archaeology (INRAP) excavating the 43,000 square-foot site are walls and masonry from a structure dating to the Roman Republican period shortly after the conquest of Gaul. They found the hearth of a bread oven in one of the rooms, and a later dolium, a massive ceramic jar probably used to store foodstuffs. 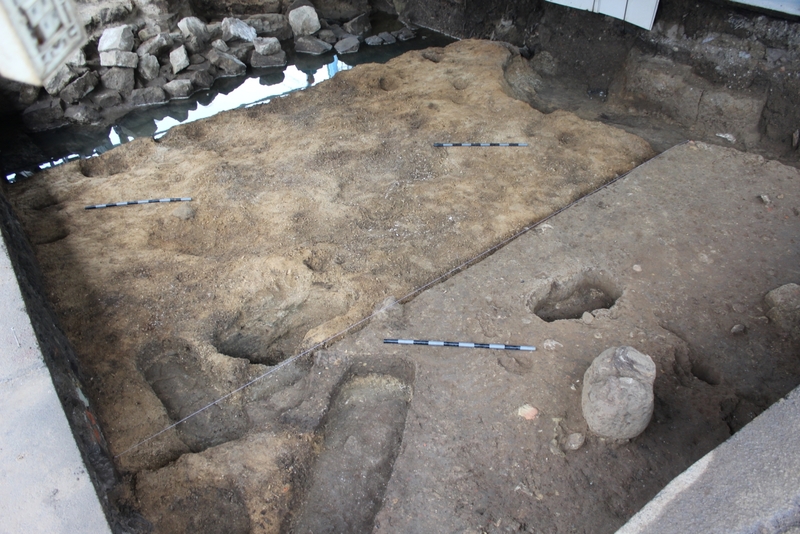 In another part of the site, archaeologists discovered a large colonnaded building which may have begun as a public building and later been converted to a private dwelling. There are four connected rooms, two of them with concrete floors and painted plaster walls, one with a mortar floor embedded with opus signinum tiles. That room leads to the largest, most glamorous of the four: a 645-square-foot space with two large mosaics in the floor. 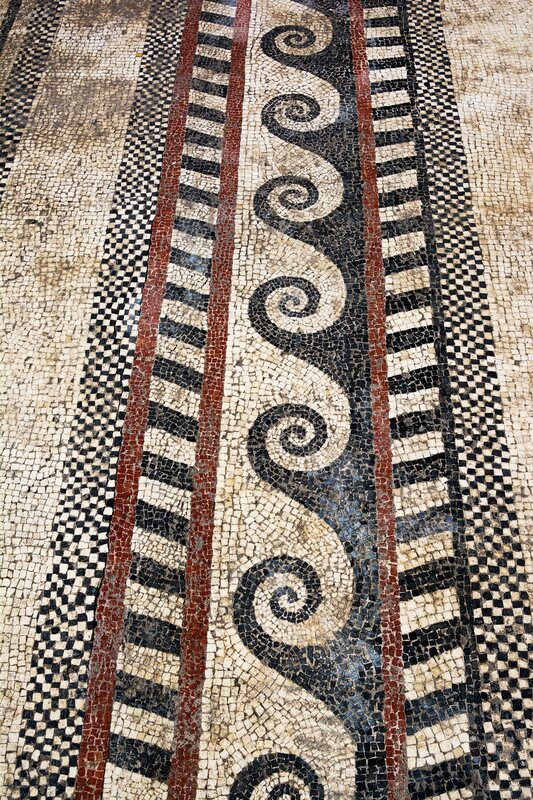 The most spectacular mosaic is bordered with geometric designs — meanders, checkerboards, waves, stripes — surrounding a medallion with rays and chevrons. 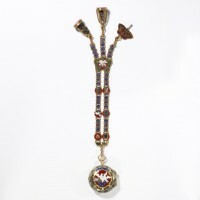 At the four corners of the medallion are four polychrome animals: a duck, an eagle, a fawn and an owl so enchanting it gives that enameled Roman fibula a run for its money. 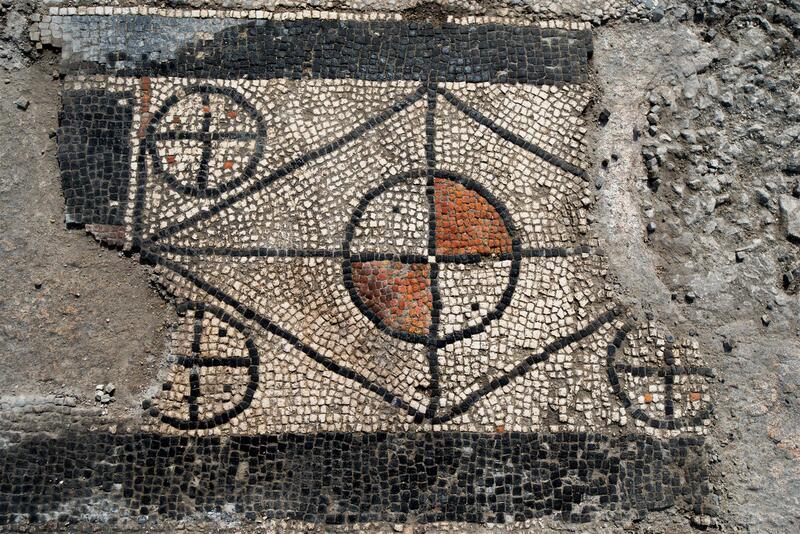 The second mosaic is much the same size, but its central motif — also geometric borders around a medallion with rays — is much smaller, so there’s a lot more white tile covering the surface area. 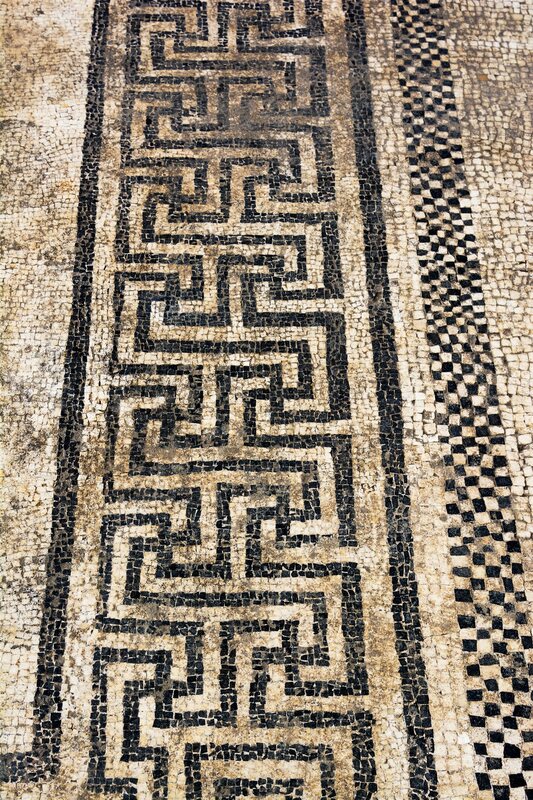 The building was in use until the end of the 1st century A.D. After that, the space was rebuilt several times and the mosaics, damaged over the years, were not repaired. The clean mortar floors were also damaged, but replaced with cheaper, rougher concrete. 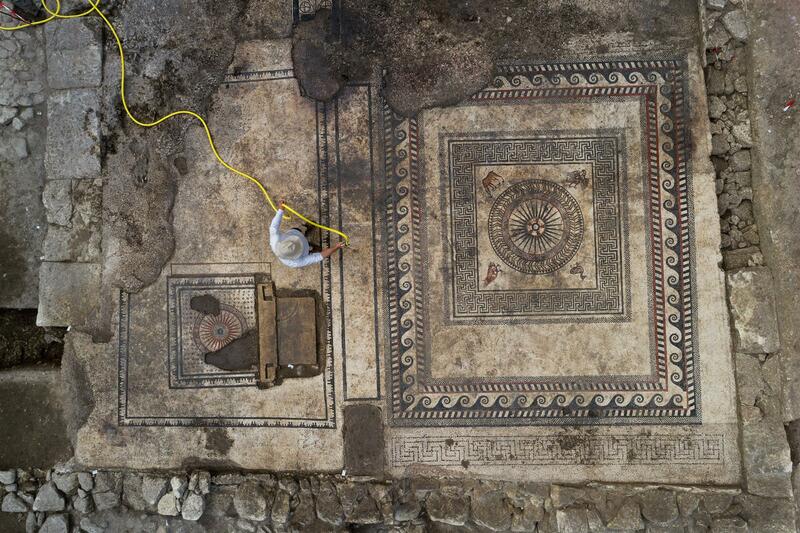 Other buildings found on the site include a large structure that was probably a 1st century A.D. domus, a large single-family home. Multiple dolia were found in this building, indicating the location was used for wine storage and/or production. 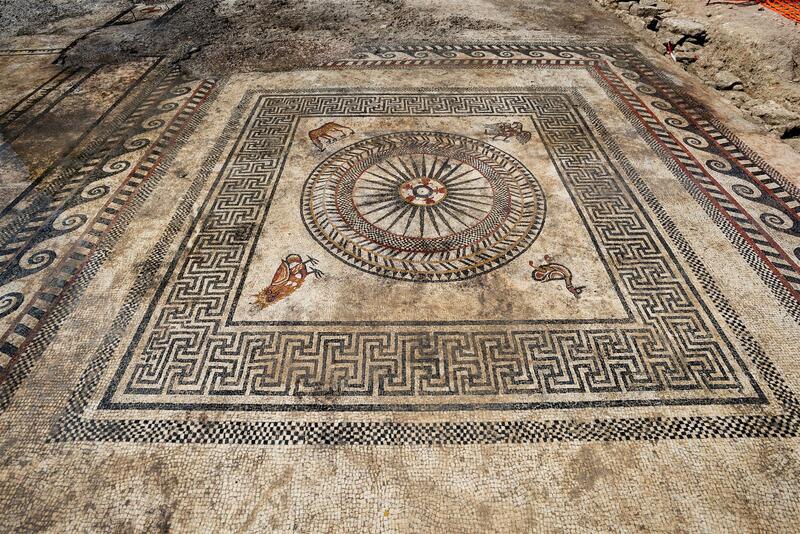 There was a mosaic floor found in this dwelling as well, made of individual tesserae in a geometric pattern with dolphins on each of the four corners. This building too was restructured in the late imperial era. 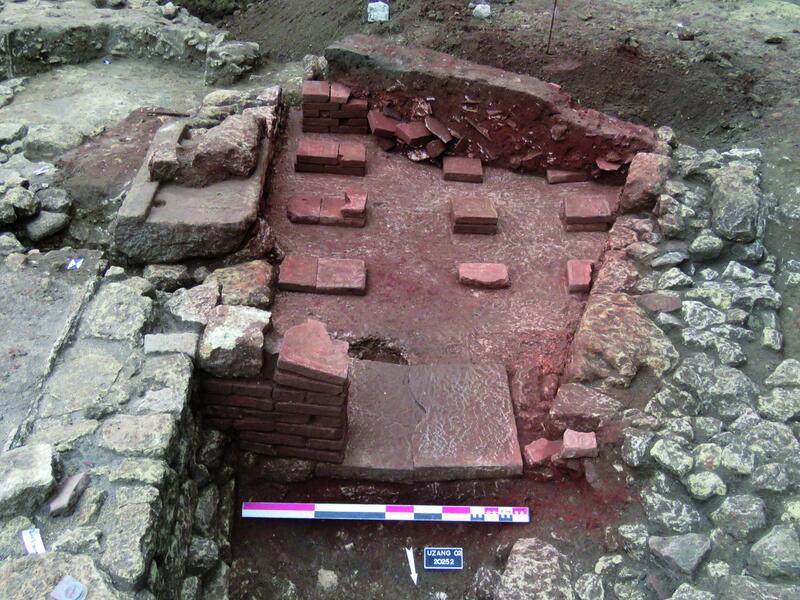 A new hypocaust-heated room was built, all of which remains now are the brick piles that allowed the hot air to heat the floor. The building appears to have been in use until the very latest antiquity, through the 7th century. The site will be open to visitors this weekend who will get tours of the finds guided by INRAP experts. This is a one-time deal, I’m afraid, as the current plan is for the mosaics and all the other above-ground elements to be dismantled and raised next month. The dig will continue until the end of the year and the construction of the school is scheduled to be completed in 2019. 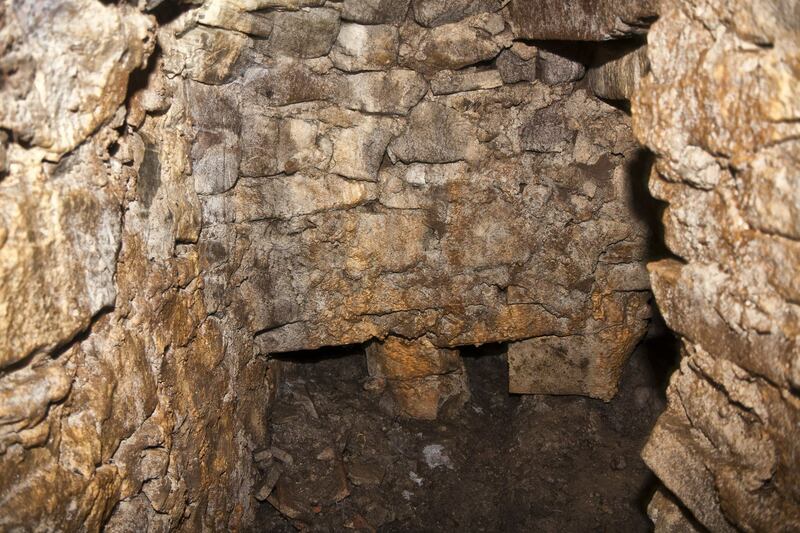 Archaeologists have unearthed a medieval Jewish cemetery in the Trastevere neighborhood of Rome. The discovery was announced last week, but it was made over the course of six years of excavations done in conjunction with the restoration of the Palazzo Leonori, now the new headquarters of the Assicurazioni di Roma insurance company. It was under the palazzo’s courtyard that 38 graves were found, neatly aligned in rows. Iron nails and wood fragments indicate the bodies were buried in coffins, now long-decayed. 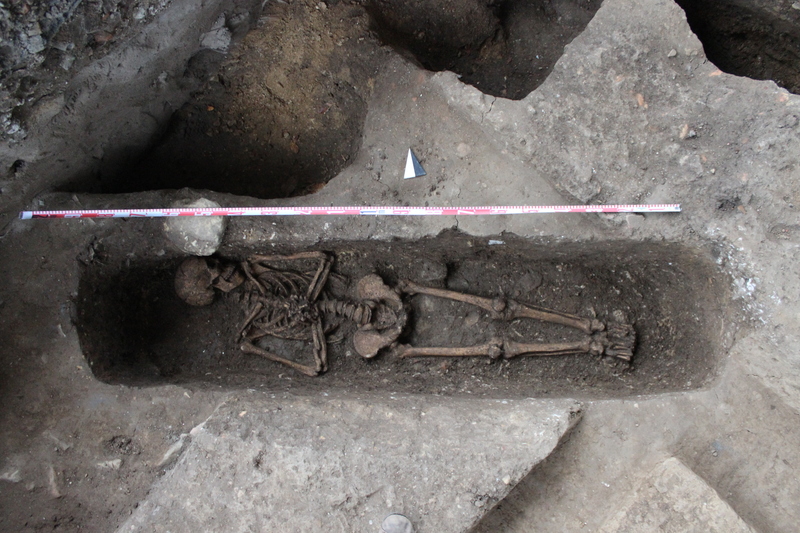 Each grave contained a well-preserved, intact, articulated skeleton. The remains are of adult men and women, mostly men, and contain almost no grave goods. 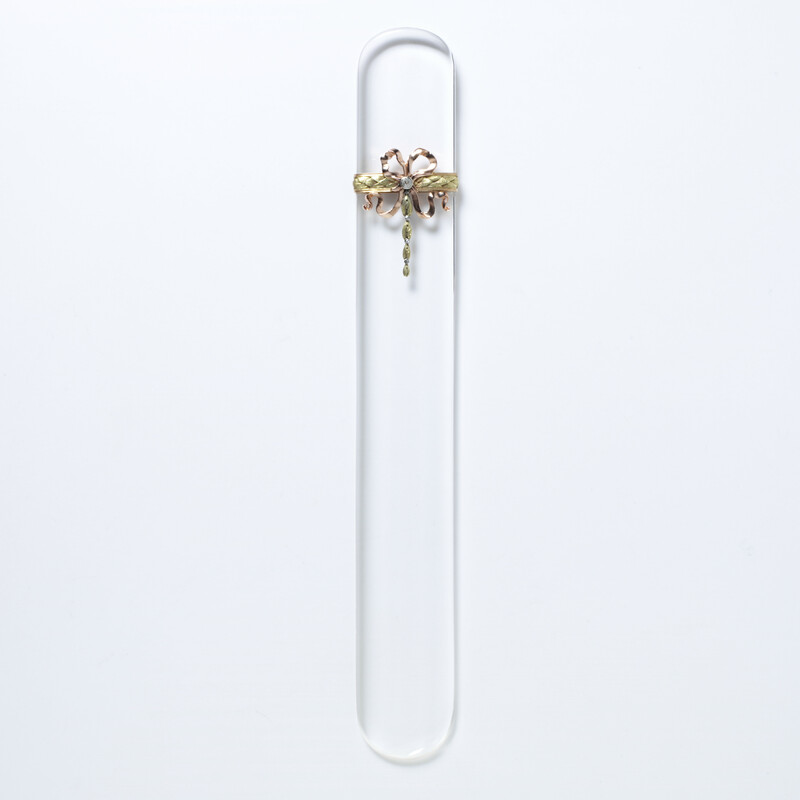 The only exceptions were two of the women, found wearing small gold rings, and one man who was buried with a set of iron scales, perhaps an indication of his profession or a metaphoric representation of a just man. Examination of the bones found signs of malnutrition and protein deficiencies. These were not wealthy people. Because there were no grave markers discovered and with the excavation area limited by later construction, at first archaeologists weren’t sure whose bodies they’d found. They searched archives for maps and documents that might shed light on the question, and the find spot was marked on several maps as the Campus Iudeorum, or Field of the Jews, the cemetery of the Jewish community that lived in Trastevere from the mid-14th century through the mid-16th. Radiocarbon dating of the remains returned dates within that range. 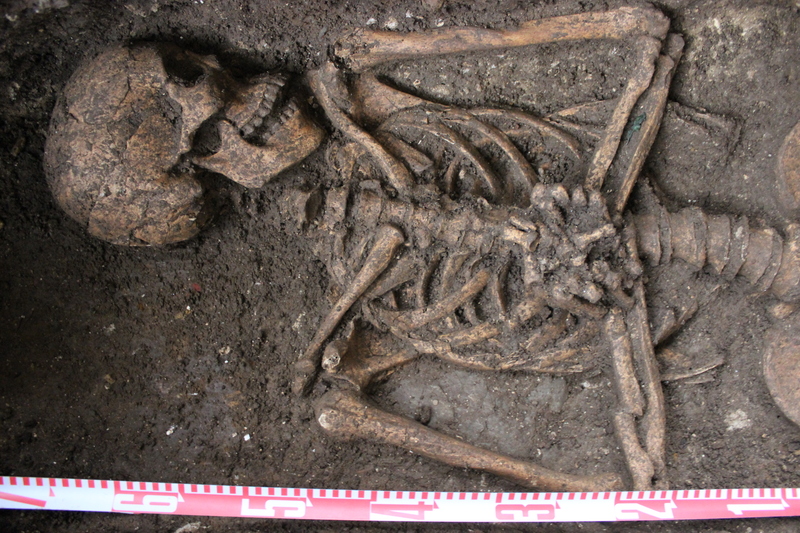 The lack of grave goods is also characteristic of Jewish burials. The last piece of the puzzle fell into place when a marble fragment inscribed in Hebrew with the words “here lies” was discovered nearby. Since it is completely senseless and inappropriate to be in a situation where Christian piety allows the Jews (whose guilt-all of their own doing-has condemned them to eternal slavery) access to our society and even to live among us; indeed, they are without gratitude to Christians, as, instead of thanks for gracious treatment, they return invective, and among themselves, instead of the slavery, which they deserve, they manage to claim superiority…. So the living Jews who stayed in Rome after 1555 moved across the river into the ghetto hellhole. Their deceased ancestors remained in place. It was not to be a peaceful sleep of death, alas. In 1625, our Barberini friend Pope Urban VIII found the time between tapestry appreciation, adding bees to everything and stripping ancient bronze off the Pantheon to decree that all Jews in Rome must be buried in unmarked graves. No names of Jews were to be carved in stone, period. (Exceptions were occasionally made for very prominent rabbis or wealthy men.) Extant gravestones were to be destroyed. Then in 1645, the cemetery was built over when a new city wall was constructed. This is why only a single fragment of a headstone was found in the excavation. The Jews were allowed to move what remains they could to a new cemetery on the Aventine, but struggle followed them. Giambattista Nolli’s 1748 map of Rome marks the spot as the “Ortaccio degli Ebrei,” meaning “Garden of the Jews,” although that doesn’t convey the pejorative connotation of the suffix -accio. (The Ortaccio was the name for 16th century Rome’s red light district where the prostitutes were walled in much like Jews were in the ghetto.) Interestingly, Nolli’s map also shows how the Jews were forced to move across the river to the Aventine and may have been bumped one more time after that. The Trastevere cemetery site is on the left side of the map outlined in green. On the right side outlined in red is another “Ortaccio degli Ebrei,” presumably the active one in Nolli’s time, directly overlooking the Circus Maximus, which was itself divided into farmland. Just a hop to the southwest outlined in blue is the “Ortaccio Vecchio degli Ebrei,” or the “Old Garden of the Jews.” If that was the old one, the other one must have been (relatively) new. The Aventine cemetery had an even shorter life than the Trastevere one. It was destroyed in 1934, this time courtesy of Mussolini’s grandiose plan to redesign Rome to showcase its ancient glories. Workers dug up all of the graves, put the bones in boxes and moved them to the Campo Verano cemetery outside the Roman walls where they were reburied in the Jewish section. The last Garden of the Jews is now a rose garden. Today only a modest memorial records what had once been a field of white gravestones with generations of Roman Jews buried beneath them. The Palazzo Leonori site will become a mini-museum where some of the discoveries made in the six years of excavation will be on display. 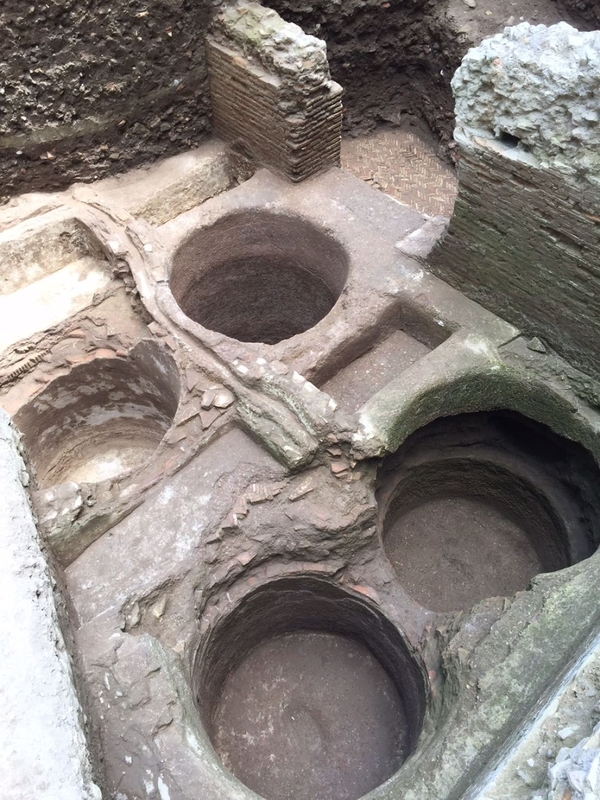 Large plastered tubs identified by an inscription as part of the Coraria Septimiana, 3rd century A.D. tanneries built by the emperor Septimius Severus to tan leather products for exclusive supply to the Roman army, will be viewable to the public in the courtyard of Palazzo Leonardi, a sort of mini-archaeological park. The human remains will not be part of any future such plans, nor will they be studied further out of respect for the dead. Presumably they will be reinterred, but no decision has been announced at this time. 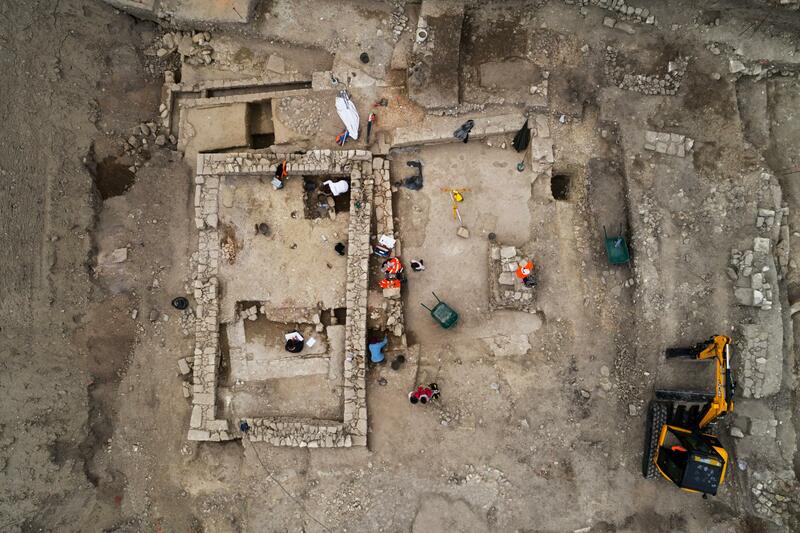 The archaeological team is working closely with rabbinical authorities, among them Rome’s Chief Rabbi Riccardo Di Segni, to determine the next steps. At 2:15 PM on Saturday, March 18th, 2017, Keith Gregory walked up to Mr and Mrs William Hallett by Thomas Gainsborough, hanging in the British paintings room of London’s National Gallery, and slashed it twice with a pointed metal object. The man was immediately apprehended by the Gallery Assistant with the aid of members of the public. They detained him until the police arrived and arrested him. The next day the 63-year-old man was charged with causing criminal damage. The painting was removed to the museum’s conservation lab where conservators were relieved to find the “damage was limited to two long scratches which penetrated the paint surface and the canvas support, but did not break through the canvas lining.” National Gallery experts determined the repairs to the pigment layers would be relatively easy to make and it would not be long before the Gainsborough was back on public view. Ten days later, it was hanging in its spot in room 34 of the National Gallery again. Larry Keith, the National Gallery’s director of conservation, said that the museum believed that the painting was attacked with a drill bit or a similar object. He said that the restoration process had included re-adhering loose paint that was still attached to the canvas; filling in areas of paint that had been scratched away, with a filling agent; painting the affected areas with new paint that had been closely matched in color and texture to the original; and, finally, covering the entire canvas with a light varnish. 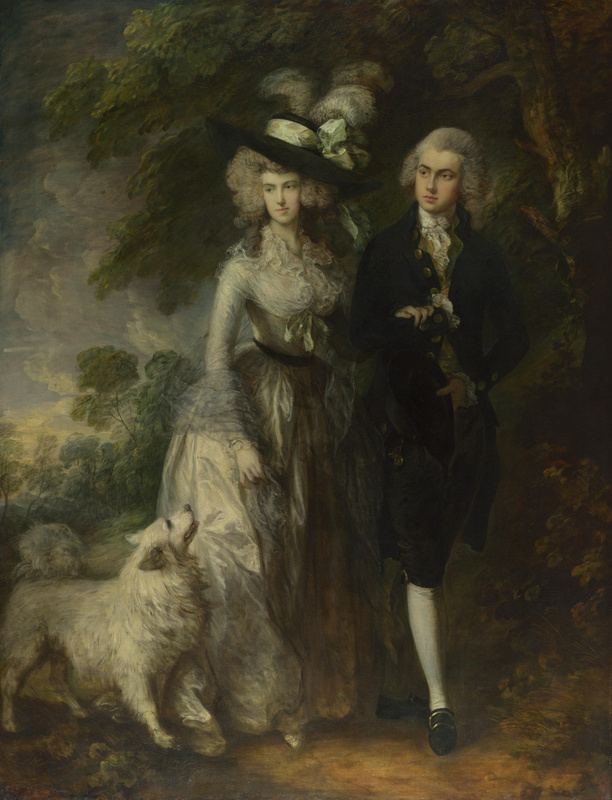 Mr and Mrs William Hallett, better known as The Morning Walk, was painted in 1785 when Thomas Gainsborough was at the height of his popularity. Originally a landscape painter, in the late 1740s Gainsborough switched focus to portraiture when he realized that was where the money was. 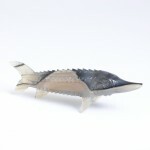 At first his sitters were the local big fish in a small pond. Looking to appeal to a higher class of clientele, he studied the portraits of Anthony van Dyck and by the 1770s had moved up from country squires to counts and dukes. 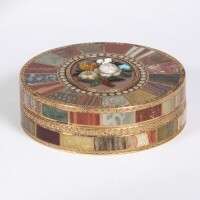 In 1780, he received his first commissions from King George III and Queen Charlotte. Many more would follow until his death in 1788. The couple in The Morning Walk are William Hallett and Elizabeth Stephen, then 21 years old and soon to be married. Gainsborough depicted them walking through a country wood with an attentive white dog at Elizabeth’s side. Mr. Hallett is wearing a black silk velvet suit, while Elizabeth is clad in a gown of ivory silk with a black sash around her waist. This was a popular fashion among the Georgian aristocracy, having a portrait painted of them in a Romantic, pastoral setting wearing their most elegant clothes. Mr. Gregory is currently out on bail and is scheduled to appear before a higher court next month. There is no word yet on what his motivation may have been. It seems such an innocuous painting to arouse slashing ire, but that’s never stopped people with ill-intent from fixating on certain artworks before. 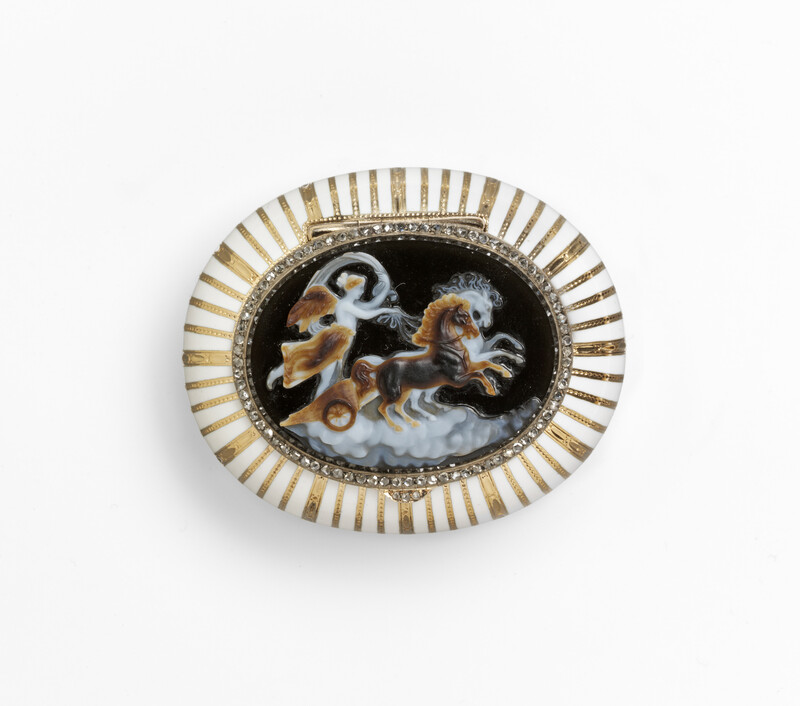 The The Victoria and Albert Museum (V&A) is the proud new owner of nine exceptional works by Carl Fabergé donated by the son of the late Kenneth Snowman, one of the world’s most prominent Fabergé experts. Two rare works by 18th century goldsmith Johann Christian Neuber were also part of the donation. Nicholas Snowman donated the pieces in the Kenneth and Sallie Snowman Collection under the Cultural Gifts Scheme, a program that allows the donation of significant cultural heritage objects in exchange for tax savings in the amount of 30% of their market value, in this case a discount of £615,000 ($772,000). 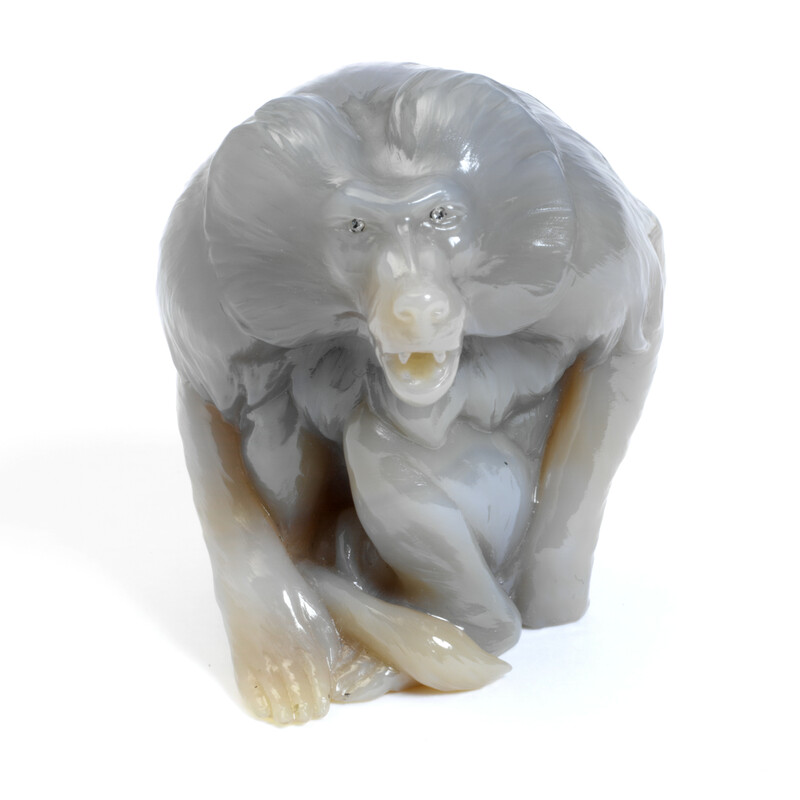 The Fabergé pieces in the donation include four animals masterfully carved out of chalcedony and agate for Queen Alexandra, wife of King Edward VII and Tsar Nicholas II’s aunt, herself an accomplished wood carver. 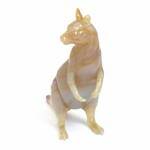 Alexandra’s Fabergé animals are a hissing baboon, a sturgeon, a kangaroo and a chinchilla. 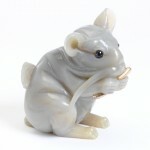 Other animals in the collection include a seal carved out of obsidian with such dazzling attention to detail that the skin texture is perfectly matched to the stone, and a quartz hare inspired by Japanese netsuke. One of the objects, a rock crystal letter opener, has a moving sentimental connection to the last of the Romanovs. It was a present given by Tsarina Alexandra to her onetime English governess, Miss Jackson, for Christmas in 1900. Miss Jackson had become a surrogate mother for Alexandra after her own mother died from diphtheria, contracted during her tireless nursing of her entire family when they were stricken by the disease. Alexandra was just six years old when her mother died, so Miss Jackson provided much-needed support to the bereft child. 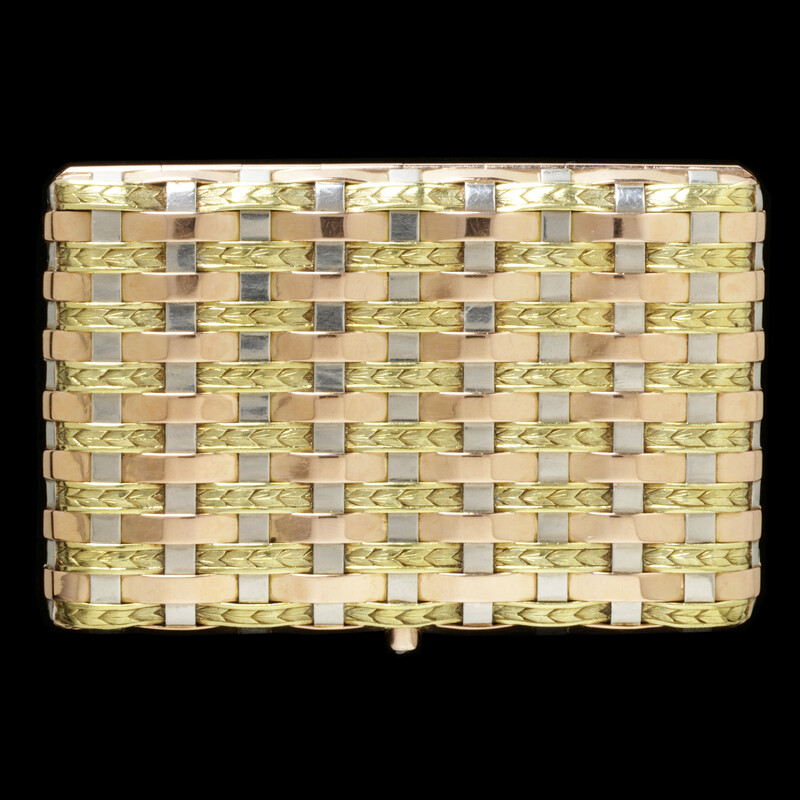 Kenneth Snowman is a Fabergé legend. 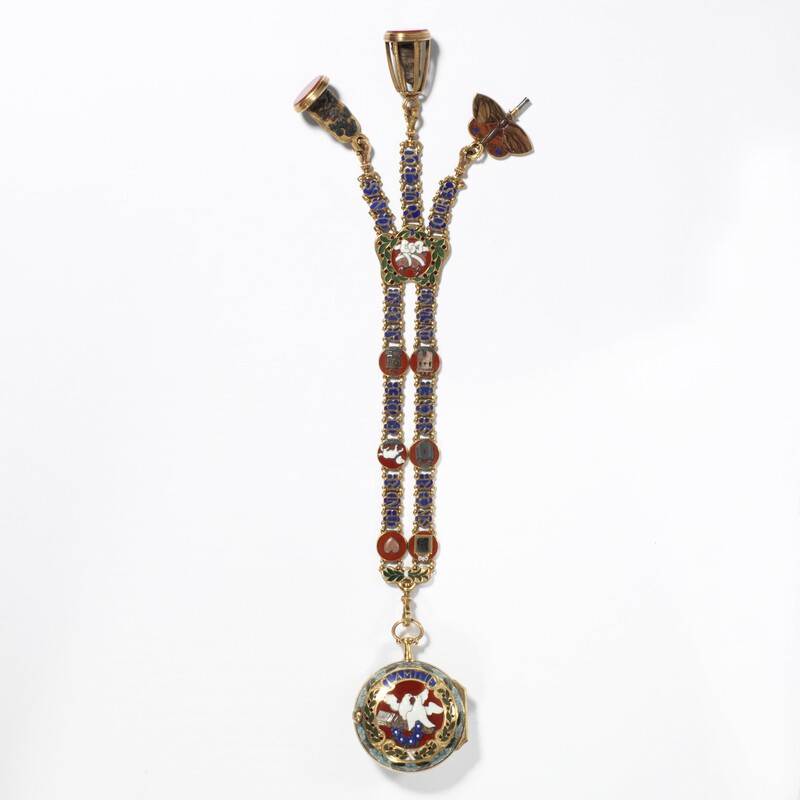 The son of jeweller Emanuel Snowman and Harriet Wartski, daughter of Morris Wartski, founder of the Wartski company which, thanks to Emanuel’s buying trips to the Soviet Union in the 20s and 30s when Fabergé had dropped out of cultural consciousness, became the leading dealers and experts in Fabergé’s exquisite Imperial Eggs and the many jeweled and enamelled treasures he made for the aristocracy of pre-Revolutionary Russia. Born in 1919, as a child Kenneth played with some of the nine Imperial Eggs his father brought home from the Soviet Union. Little wonder, then, that as an adult he become a published Fabergé scholar, curator and world-renowned expert. When his father-in-law died, he became chairman of Wartski, which you might recall played an integral role in the stranger-than-fiction saga of the lost Imperial Egg found by a scrap metal dealer in the US midwest. Nicholas Snowman’s choice of the V&A was a tribute to his father’s deep bonds with the institution. Underscoring the generosity of the act is a 13th object Nicholas Snowman donated to the V&A, only he didn’t do it directly. 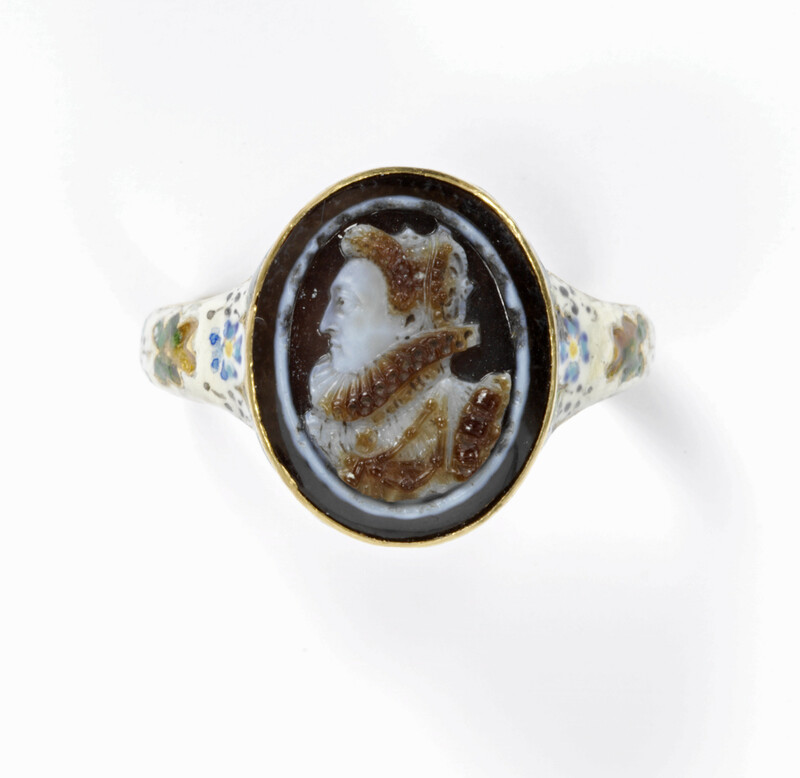 He deliberately donated a 16th century cameo portrait of Elizabeth I later mounted on a ring to the Art Fund who then (by arrangement) donated it to the V&A. He did this in recognition of the Art Fund’s hugely successful campaign to acquire the Armada Portrait for the Royal Museums Greenwich. 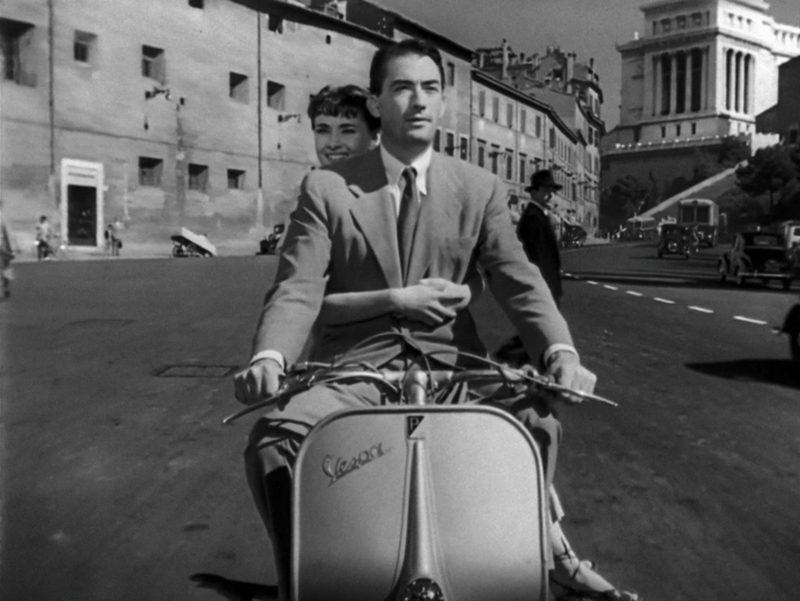 The iconic Vespa that supported the supple fundaments of Audrey Hepburn and Gregory Peck as they scootered their way through the Eternal City in the 1953 classic film Roman Holiday is currently for sale at the online auction site Catawiki. 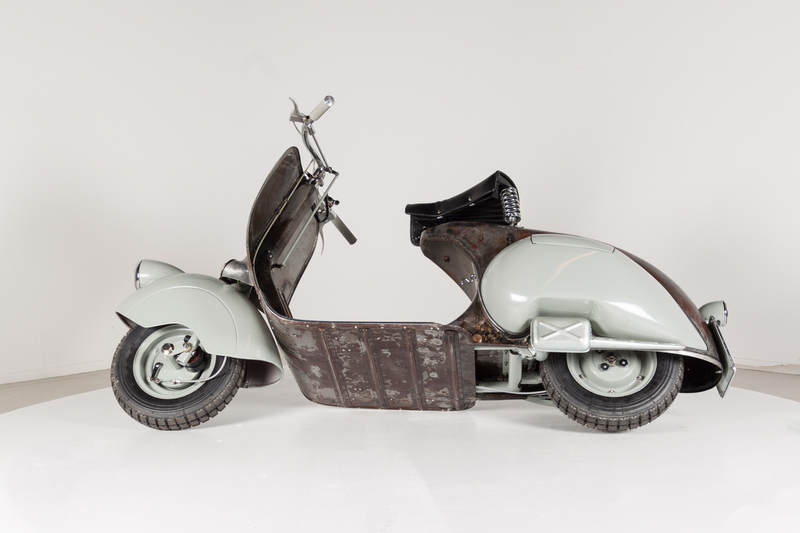 As if co-starring with two of the all-time greatest movie stars in one of the all-time greatest movies weren’t enough, this particular Vespa is also the oldest in the world. With a chassis number of 1003, the Vespa 98cc Serie 0 Numero 3 was the third Vespa ever made. Numbers one and two are long lost, leaving number three with the title of the oldest Vespa. Piaggio began in the late 19th century as a manufacturer of railroad cars. Towards the end of World War I, the company switched its focus to aeronautics but continued to manufacture a wide array of vehicles and parts suitable for civilian and military use. 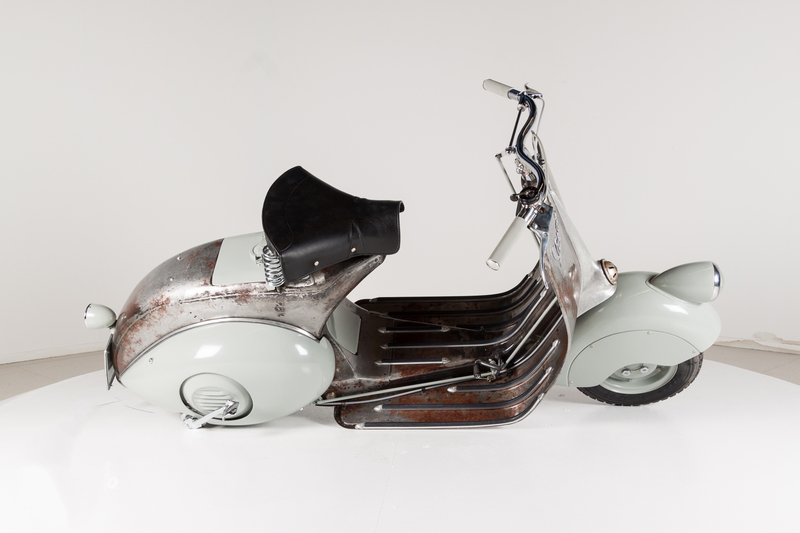 When its main factory was destroyed by Allied bombs in 1940, Piaggio’s production was severely curtailed. After the war, Enrico Piaggio, son of company founder Rinaldo, wanted to produce a low-cost, easy to drive vehicle that could be a reliable mode of transportation for the population of a country whose economy and infrastructure were in ruins. He asked Corradino D’Ascanio, an aeronautical engineer who had worked for Piaggio building airplanes during the war, to scare up a design for a small motorcycle that had none of complications and bulk of its big brothers, making it suitable for wide popular use. 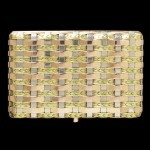 Corradino threw out all previous designs and in a matter of days created an entirely new one. His innovations included a gear shift on the handlebars to make driving easier, tires that could be replaced by anyone without need of a mechanic, a body design that protected riders from mud, dust, water and assorted street debris, an enclosed engine that saved street clothes from the scourge of grease stains, and a driving position that allowed riders to be comfortably seated even for long journeys. When presented with the prototype in April of 1946, Enrico Piaggio exclaimed delightedly, “It looks like a wasp!” And that’s how the Vespa got its name. In the first decade of manufacture, the Vespa went from a production of 2,000 of the first V98cc models to one million in 1956. In 1965, 3.5 million Vespas were sold, one for every 52 Italians. Today it remains one of the great successes in motor vehicle history, and the original Vespa is an icon of Italian design. There’s a 1955 model in the Museum of Modern Art in New York City. The indelible images of Audrey Hepburn and Gregory Peck zooming through Rome on that Numero 3 certainly played a large part in making the Vespa a worldwide icon. The Serie 0 were prototypes, a sort of run-through of different options, not production units, which is why they are also known as the “pre-series.” Only 60 of the series were manufactured. 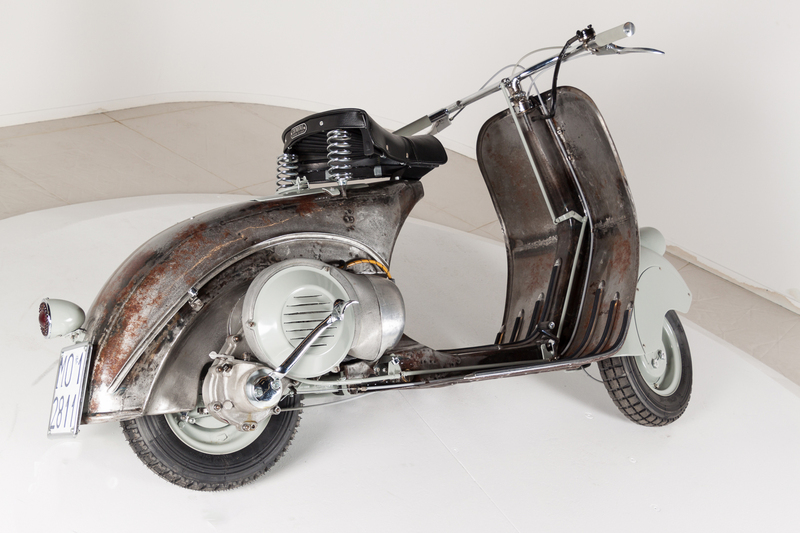 Every part of the Serie 0 Vespas was individually made specifically for one bike. You can see the chassis number 1003 stamped not just on the frame, but on the fenders, muffler, kickstand and many other parts. This vehicle was lovingly handcrafted piece by piece. It’s also tough as nails. The paint is gone, but 71 years after it was made, Number 3 is still in working condition. As is the case with some cars, Vespa scooters have become increasingly valuable over time. 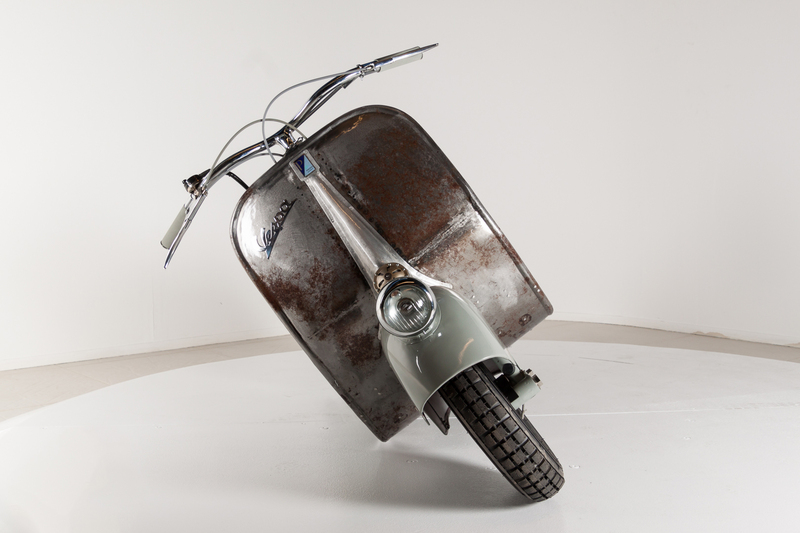 “Thanks to a huge fan base, old Vespa scooters tend to keep their monetary value,” said [Vespa expert Davide] Marelli. “A Vespa scooter from the 1970s, for example, can be worth five times as much as its original retail price. The older the Vespa, the more valuable it is,” he said. For many years it has belonged to a private collector who has a prestigious, very select group of 60 rare and important Vespas. The presale estimate is 250,000-300,000 euros ($268,150-$348,600). 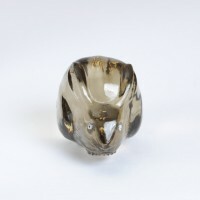 Bidding is already up to $195,748 and there are still 36 hours to go before the sale closes. A small price to pay for the chance to own a piece of history and to touch butts with Audrey Hepburn and Gregory Peck via the Transitive Postulate. 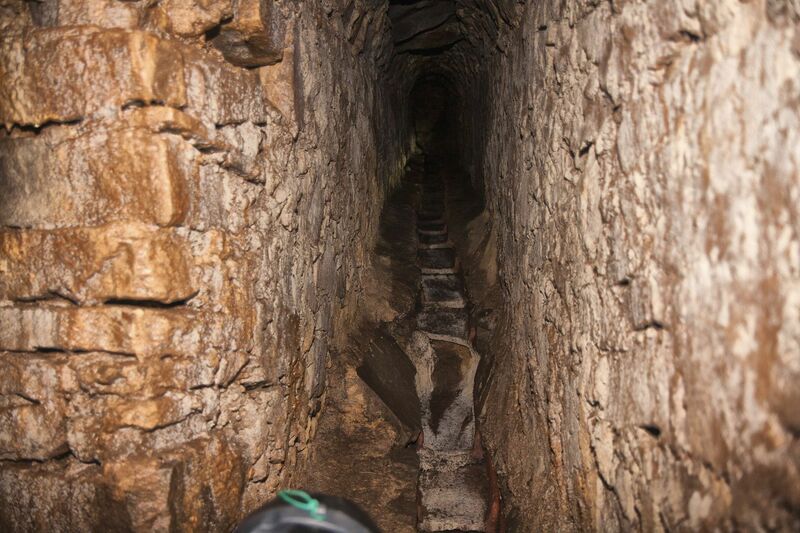 Two forestry workers have discovered a 16th century aqueduct in the southern Italian hamlet of Monte Cicerale. Franco Avenia and Edoardo Palumbo were clearing underbrush and brambles in a wooded area above the highway when they stumbled across a small stone structure partially embedded into a hillside. A square opening in the structure led to an underground passage. The two contacted a friend of theirs, local historian Simone Gioia, who quickly ran to join them in exploring the find. Crawling on his hands and knees through very constricted spaces, he found the oldest part of the network was a tunnel dating to around 1500. On the ground in the center of this tunnel runs an overlapping series of earthenware tiles that create a channel. Hard water rich in calcium still flows over the tiles. Their downward slope allows the water to flow indefinitely — the same gravity tech the Romans used in their aqueducts, although they went much longer distances and thus had far shallower inclines. Avenia, Palumbo and Gioia explored about 50 meters (164 feet) of the aqueduct, which was pretty damn bold of them because those tunnels are just barely big enough to fit a grown man on all fours. Simone Gioia described it as “a beautiful, albeit claustrophobic, experience.” He also noted the aqueduct is in an exceptional state of preservation. Monte Cicerale is on the ancient Via Poseidonia that led from the ancient Greek colony of Paestum (it was called Poseidonia by the Greeks) to the very heart of the Cilento region in Campania. It has a tiny population of 312 souls, but the town of Cicerale, less than a mile away, can boast 1,200 residents. Even in the 1500s these were remote hilltop communities, sparsely populated with very limited infrastructure. The people were hard-working, poor and primarily engaged in agriculture and animal husbandry, fields of endeavor that require a steady supply of water. It seems they built themselves an aqueduct to ensure that supply using local stone and what look to me like roof tiles. They did an unreservedly great job of it too, as the photographs show. It is a true feat of engineering. 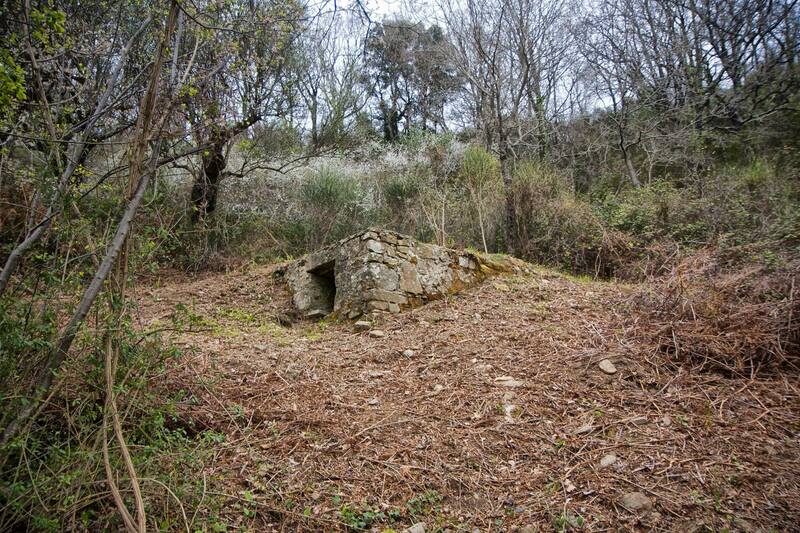 Archaeological remains attesting to the rural history of the Cilento region are extremely rare. The aqueduct is, as far as anyone knows, the oldest, most intact and most significant surviving example of this material history. 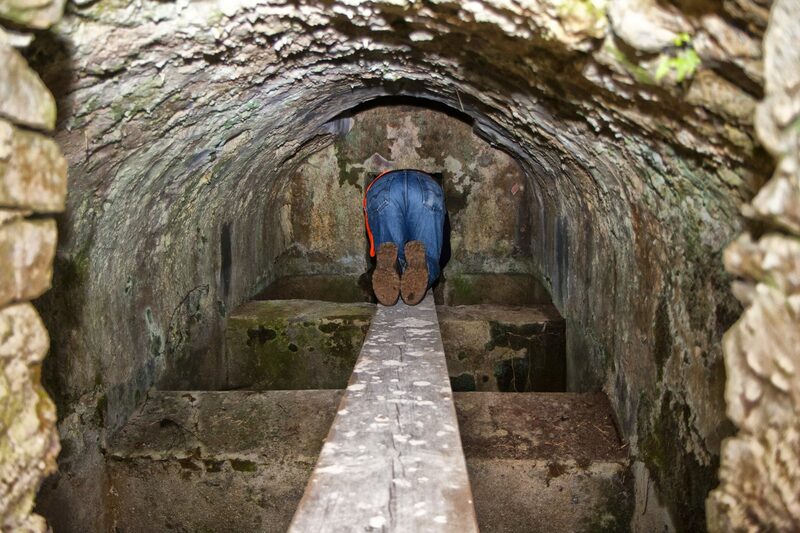 There’s no word on a professional excavation of the site, but local authorities expect the regional Archaeological Superintendency to study the aqueduct, especially now that it’s made regional and national headlines (and I guess international ones too, if I count). Simone Gioia has dozens of photographs of the aqueduct in a photo album on his Facebook page. 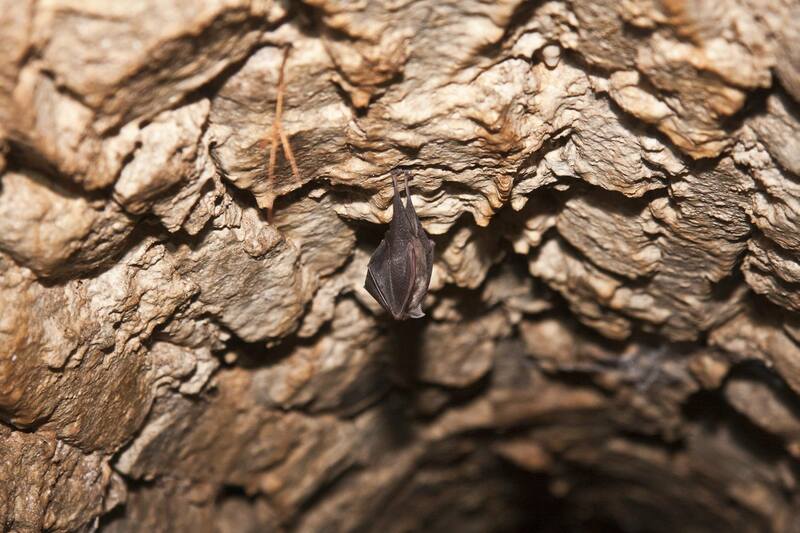 He has also uploaded video of his exploration of the tunnels. The quality is not very good, but that’s to be expected given the circumstances. 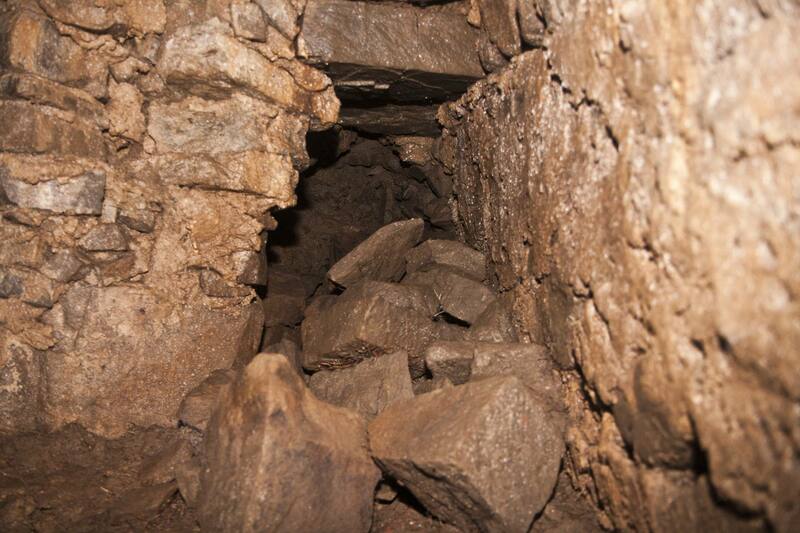 They do a fine job of conveying the constricted spaces and the excitement of the find. The Roman fort and settlement of Vindolanda just south of Hadrian’s Wall in Northumberland is perhaps best known for the 1,700 wooden writing tablets from the 1st and 2nd centuries A.D. that have been found there, preserved for 2,000 years in the site’s anaerobic soil. 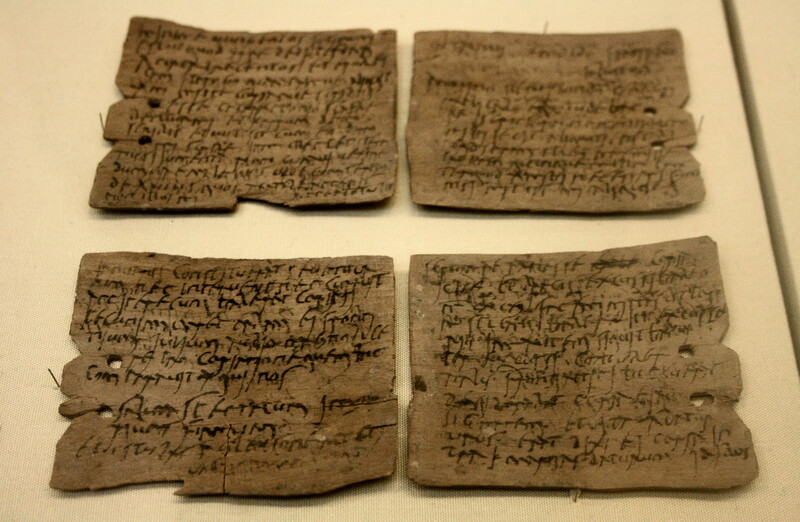 Because of the unique insight this record of daily correspondence gives us into the daily lives of the ancient Romans and Britons who lived at Vindolanda, the tablets were voted Britain’s top archaeological treasure by British Museum curators in 2003. They have been extensively studied and displayed at the Vindolanda Museum. 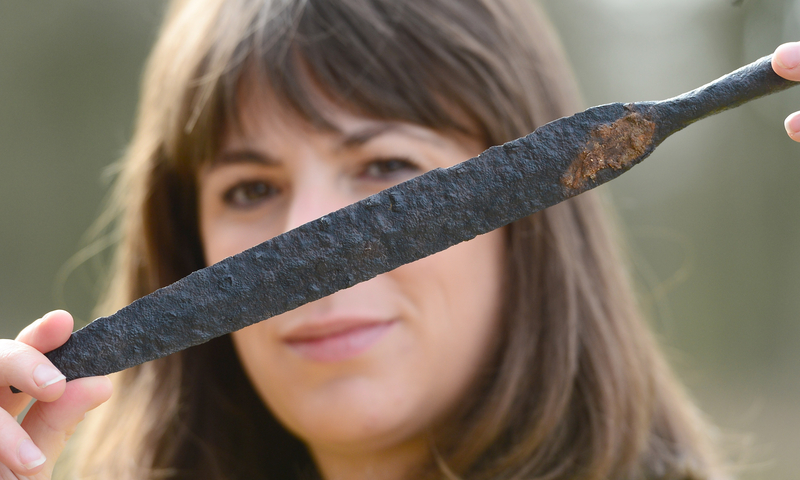 Less known are the many other wooden objects discovered at Vindolanda. Almost 1,500 artifacts have been unearthed from that blessedly waterlogged soil — cart axles, bread shovels, potter’s wheels, plank flooring, joists, that amazing inscribed barrel stave and my personal favorite, the only Roman wooden toilet seat ever discovered. They even found intact water pipes made of alder wood logs, bark still on them, that had been drilled through the length with an auger, creating a hollow center 5 centimeters (two inches) in diameter. 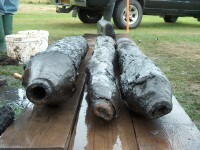 There were 30 yards of pipes joined with oak junction boxes to create a network of water mains supplying Vindolanda with fresh water from a local spring. The ends of the logs were tapered to fit a hole in a block of oak. On the other side of the block another hole was drilled and another tapered log fitted into it. That was some quality joinery. With nary a single iron or lead fitting to keep the pipes together and almost two millennia after they were installed, the alder water pipes were still working when they were excavated in 2003, carrying fresh water to a building that archaeologists believe may have been a hospital. Lead pipes, even tile ones, are fairly common in the Roman world, but wood pipes are very rare — usually only the metal collars survive — and ones still in working order are rarer than hen’s teeth. As far as I was able to ascertain, the Vindolanda pipes are unique. As rare and historically significant as they are, none of these wooden treasures have been exhibited. Conserving, stabilizing and storing them once they have been removed from their protective environment is expensive, difficult work. Creating a display space with the technology to ensure the long-term preservation of the wooden objects while making them viewable to the public is a far greater challenge still. A Heritage Lottery Fund (HLF) grant has gotten the ball rolling. The Vindolanda Trust was able to secure a development grant of £20,400 ($25,400) from the HLF to develop the plans for a new addition to the site’s already excellent museum. The new space will be dedicated solely to the wooden artifacts that have been hidden away in storage for years. The popular museum will be expanded to create a new gallery with special display cases allowing temperature and humidity to be kept at safe levels. Not only will this mean their story can finally be told but it will also ensure they survive for future generations to enjoy. Visitors will also hear the incredible survival story of the collection – from the science behind how they lasted two millennia, to their conservation and the research that is uncovering their origins. Now, obviously the new gallery will cost vast sums more than the initial grant. This is just the first step. The Vindolanda Trust must have a fully developed and budgeted plan for the new gallery before the HLF can consider a much larger grant for the actual construction phase. Once the plans are complete, the Trust will apply for the full grant of £1,339,000 ($1,670,000). Then we can gaze in awe at the toilet seat and give it its proper respect. Some might be tempted to take a bunch of selfies squatting in front of the display case, but we’re all too dignified for those sorts of shenanigans, am I right? Researchers have discovered the earliest known color movies of the White House in the archives of the Herbert Hoover Presidential Museum-Library in West Branch, Iowa. We owe these precious glimpses of First Family life to First Lady Lou Henry Hoover, an enormously accomplished woman — Stanford graduate, world traveler, co-translator with her husband of a Latin mining text by Agricola, fluent Chinese speaker (she remains to this day the only First Lady to speak an Asian language) — with a wide variety of interests, among them photography. When the pictures started moving, she was an enthusiastic early adopter of the new technology and was shooting home movies with her own camera by the early 1920s. When Kodak introduced the Kodacolor motion picture process in 1928, Lou Hoover was on it like white on rice. Kodacolor was an additive color system, filmed on black-and-white stock through a three-colored striped filter. When footage was shot, the three colors were recorded in strips on the film in different densities and proportions depending on the natural color of the subject. The camera had to be used at a very specific frame rate in order for the filter to work, and bright ambient light was de rigeur. Lou Hoover started shooting in Kodacolor in 1929 and must have stopped by 1935 when the process was superseded by Kodachrome film. Her home movies capture President Hoover at leisure both at the White House and on vacation. There are shots of Herbert fishing in Florida in January of 1929, wearing a coat and tie. He was still President-elect at that time, but he believed the dignity of the office he’d been elected to required a certain formality of attire, even on private fishing trips. Mrs. Hoover also captured their grandchildren playing, their sons on vacation, historic sites of Washington, DC, dogs frolicking at the White House, White House butler Alonzo Fields and shots of Lou in the White House garden. The last of the seven reels shows the President throwing a medicine ball back and forth with staffers on the White House grounds. This sport would become known as Hooverball. Smith applied for a grant from the National Film Preservation Foundation to have the rare historic home movies restored, and the NFPF came through. They preserved the footage, digitized it and sent the reels back to West Branch in December. Worried she might damage the film, Smith said she used a hand-crank projector to play the film when it arrived. 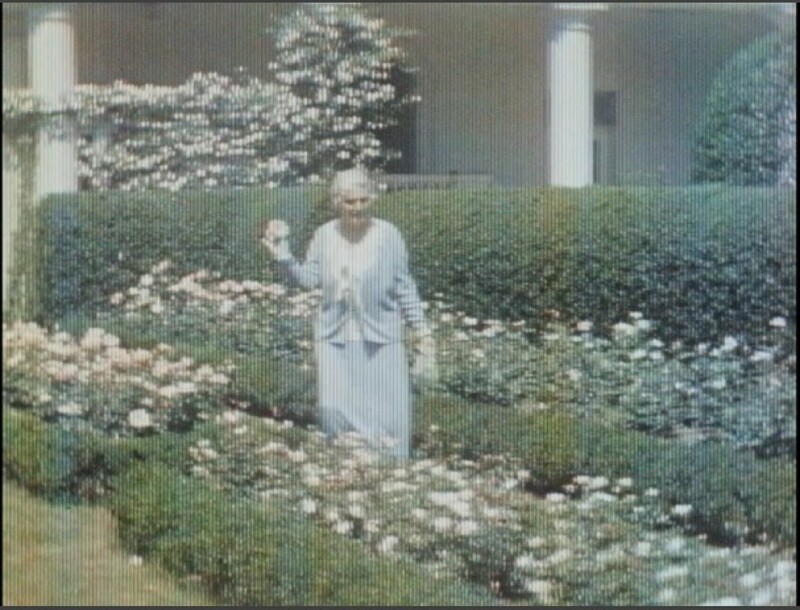 For the first time, she could see the colors of First Lady Lou Hoover’s dress and the hues of the White House Rose Garden. Archaeologists have discovered the remains of 17th century Christian burial on a Taiwanese island. 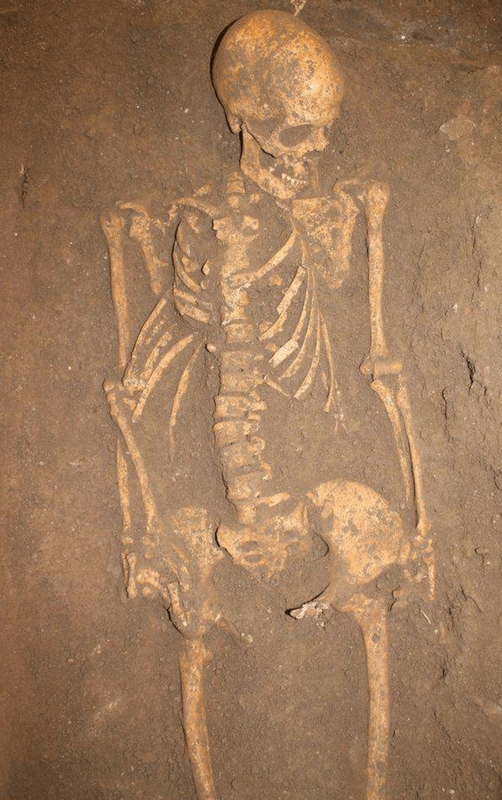 This is the earliest European burial ever discovered in the Asia-Pacific region. Under the direction of María Cruz Berrocal from the University of Konstanz in Germany, the archaeological team has excavated the site on the island of Heping Dao in northern Taiwan since 2011. The digs have unearthed material going back as far as the island’s first human inhabitants. The evidence of early European colonization is exceptionally significant, because there is little known about the period and archaeological remains are few and far between. The settlement of San Salvador de Isla Hermosa was founded on the island as a colony of Spain in 1626. They occupied the site until 1642 when the Dutch took over. After the Dutch came the Chinese, and then Japan occupied Heping Dao until the end of World War II. 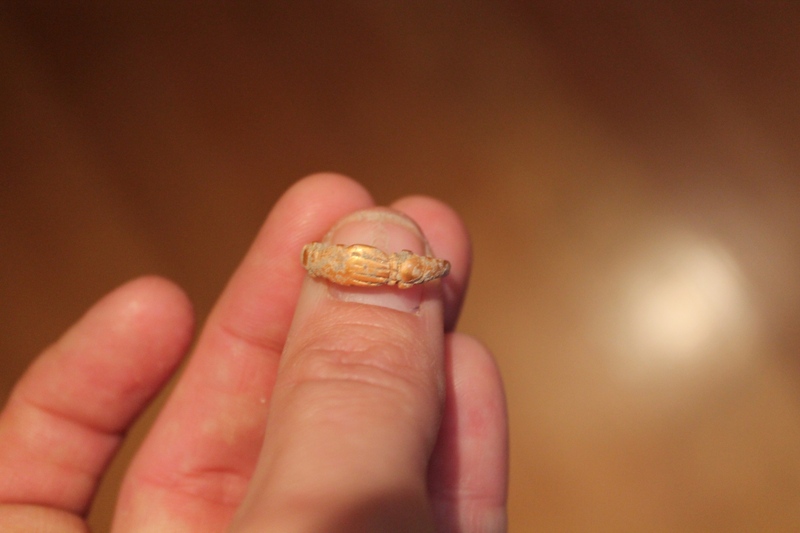 Because its time as the San Salvador de Isla Hermosa colony was brief and the island passed through several hands in the centuries since, archaeologists didn’t expect to find anything from the early colonial period. The Spanish occupation was known solely from archival records; no archaeological materials associated with it had ever been found before. Instead, the excavations revealed a wealth of important discoveries from the early days of the colony: the foundations of a church or convent and its cemetery from the Spanish settlement. Thus far, the team has unearthed six burials and disarticulated human remains. Last November, they discovered the skeleton of an adult buried with his hands folded in the traditional Christian prayer pose. 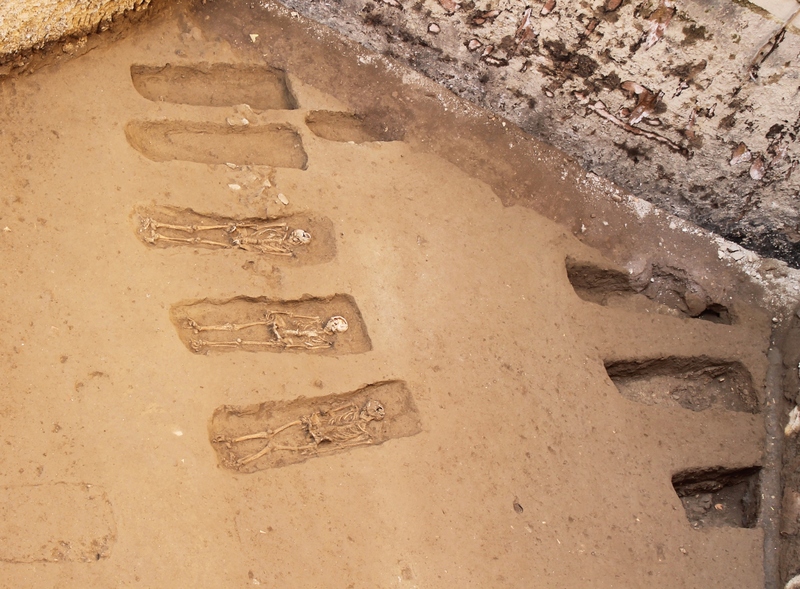 Osteological examination of the skeletal remains indicate bodies of European, Taiwanese local and maybe African origin (presumably brought to the island as slaves) were interred in the cemetery. “These are the first European burials from this time period discovered in the entire Asia-Pacific region and they contain the first documented human remains. The colonial cemetery that we unearthed is also the oldest in the region,” says María Cruz Berrocal. Additional analysis of the bones and teeth should answer a great many questions about the deceased. Recovering nuclear DNA from archaeological remains is a tricky thing, but researchers from the French National Center for Scientific Research, the Royal Belgian Institute of Science and the Max Planck Institute for the Science of Human History are now carrying out stable isotope and botanical analyses on the teeth, examining pathogen and human DNA recovered from the bones. The isotope analysis will narrow down their place of origin. Pathogen DNA will shed new light on the vectors of disease transmission between European colonists and the local people. Botanical analysis may provide important information on the introduction of non-native plant species during the early colonial period. This research has the potential to rewrite the sparse history of the Spanish colonization of the island. The historical records are deeply one-sided. According to the Spanish settlers, they dominated the island, the biggest fish in the smallest pond, and had little but contempt for the locals. The archaeology puts the lie to their self-promotional exaggerations. In fact there were very few Spanish colonizers in Heping Dao, and far from living like lords impressing the natives with their fancy European goods, they were desperately poor. They needed trade with China to survive and left behind almost nothing of their material culture. 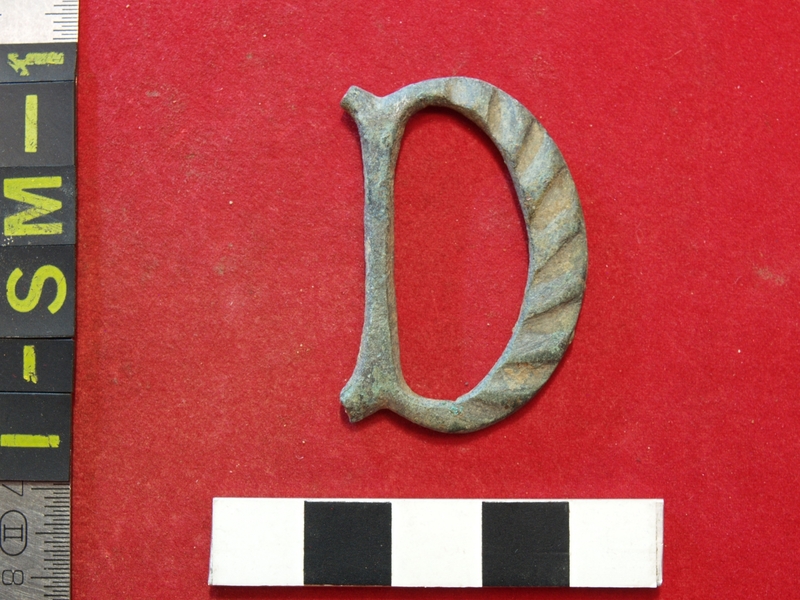 The excavation has found exactly one European artifact: a bronze buckle. That’s not how it was supposed to go. “The results demonstrate that we are dealing with an early globalisation hub here. The Spanish-style construction of the church illustrates that this colony was just as important to the Spanish Crown as other colonies established elsewhere, as in the Americas, for example. However, its attempt to gain a long-term foothold in the Pacific region was ultimately unsuccessful. For this reason, historians have since assumed that Taiwan only played a marginal role. But that is not the case,” concludes María Cruz Berrocal.